← Contributions to the SAA Blog Carnival: The Good, Bad, and Ugly of Blogging. 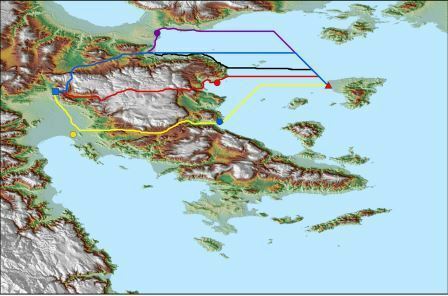 Newhard, Levine, and Phebus (2014) presented a LCP model that incorporated both terrestrial and marine costs to assist in exploring the connectivity between places. Developed in ArcGIS ModelBuilder, the initial model was streamlined by Nicola Buescher, Christina Carmack, Caleb Whitaker, Zach Campbell and Thomas Mims. The model is now available via GitHub as a Python script. This entry was posted in Academia, geospatial, informatics, Least Cost Paths, News, open source, Projects and tagged Aegean Prehistory, Archaeoinformatics, College of Charleston, Digital Humanities, ESRI, GIS, Least Cost Paths, Modeling. Bookmark the permalink.